You might think that an organisation which has as its motto the phrase “Nation shall speak peace unto Nation” would refrain from promoting the opinions of an antisemitic Holocaust denier, but that is not the case. 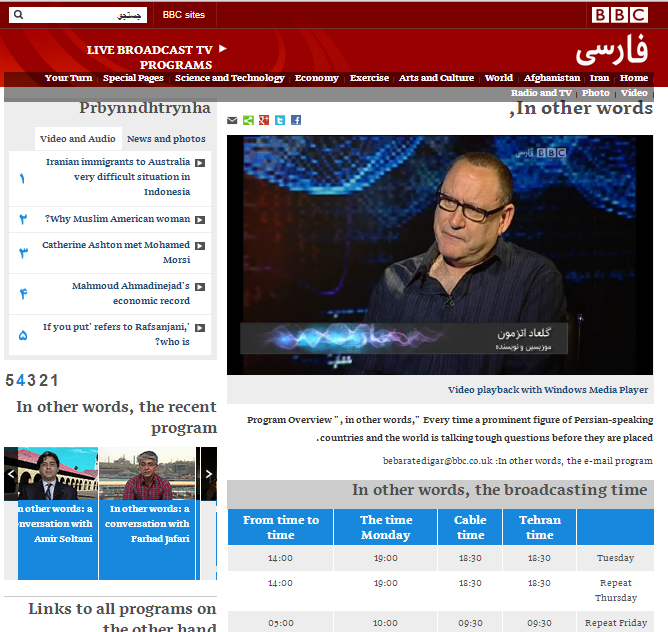 We have previously documented here examples of the BBC’s vigorous groupie-style promotion of Gilad Atzmon, especially on the World Service – see here, here and here – but on July 30th 2013 the BBC reached a new low by broadcasting an interview with Atzmon on its Persian Service. Atzmon is of course no stranger to the Iranian regime’s Press TV and yet for some reason best known to itself, the BBC – which prides itself upon being a source of “accuracy, impartiality, independence, seriousness” in parts of the world in which local media cannot be relied upon to exhibit those qualities – apparently sees nothing problematic in promoting the vile opinions of a man securely in the pocket of the regime which so recently harassed its local employees and blocked its broadcasts. It is bad enough that the BBC promotes Atzmon in English language broadcasts, especially given that anti-racists in Britain are trying to oppose the spread of his hate speech. But it is even more reprehensible and irresponsible on the part of the BBC to go to the trouble of translating his racist opinions into Persian for promotion in a part of the world which has been spoon-fed with anti-Semitism and Holocaust denial for years by its own repressive regime. The complainant next took the issue to the BBC Trust, and was recently informed that it has partially upheld his complaint, accepting that there was a breach of BBC guidelines on accuracy, but not on impartiality. One interesting part of the Trust’s response – which will be published here on July 30th at 11 a.m. GMT (see page 31 in the document titled “June”) – is the following. “The Committee agreed with the ECU and BBC News that David Ward’s words might not necessarily be interpreted to mean what the complainant said they meant, i.e. that it was a collective criticism of Jews worldwide. The Committee concluded, however, that this was not a relevant consideration in this context. It noted the purpose of the article was to report the ongoing row over David Ward’s comments and the fact that they had been interpreted in some quarters as criticism of Jews as a whole rather than confined to Jews living in Israel. Despite the complaint made by @Lsorang having been partially upheld by the BBC Trust, sadly, at the time of writing, no amendment has been made to the still available online article to reflect that fact. Participation in some international sporting events is conditioned on geography – for example the Pan-American Games, the All-African Games or the Pacific Games. The right to take part in the Commonwealth Games depends on historical and cultural alliances and in the Youth Olympic Games participation is limited by age. The Pan-Arab Games are open to athletes from predominantly Muslim Arab countries. As far as this writer is aware, it has not occurred to the BBC to imply to its audiences that controversy surrounds – or should surround – any of those sporting events due to the non-inclusion of participants who do not meet their specific criteria. So consider the following passage from a July 27th article about the Maccabiah Games by Bethany Bell which appeared in the ‘Features & Analysis’ section of the BBC News website’s Middle East page. “While a handful of Israeli Arabs take part in the games, this is an overwhelmingly Jewish event, something that the Israeli sports commentator Ron Kofman has criticised. Whether or not Bell is familiar with the ‘colourful’ reputation of the one sports journalist she elected to showcase and quote in this article is unclear, but certainly she appears to be treading a path already well-worn by other BBC journalists by using the subject of sport as a springboard from which to try to influence audience perceptions of Israel. 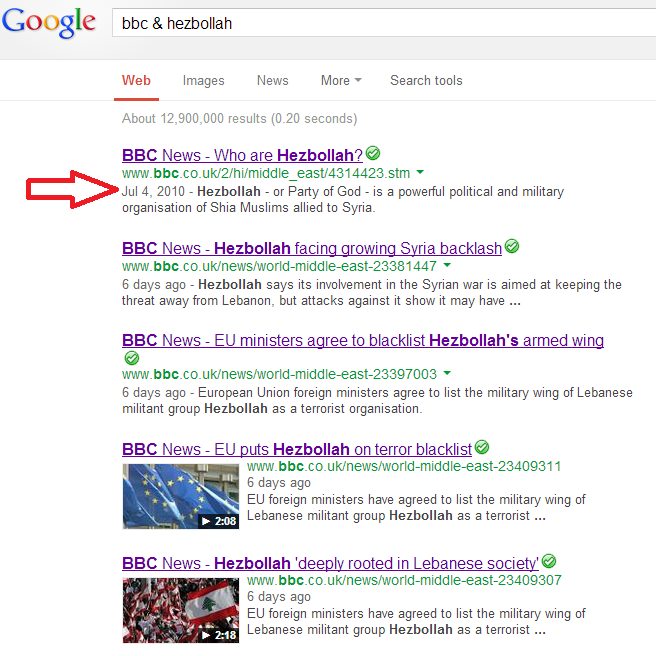 As we have noted here on several occasions – and most recently on July 18th 2013 – the three year-old profile of Hizballah appearing on the BBC website is sorely lacking up to date information and thus misleads audience members seeking background information to enhance their understanding of news stories. 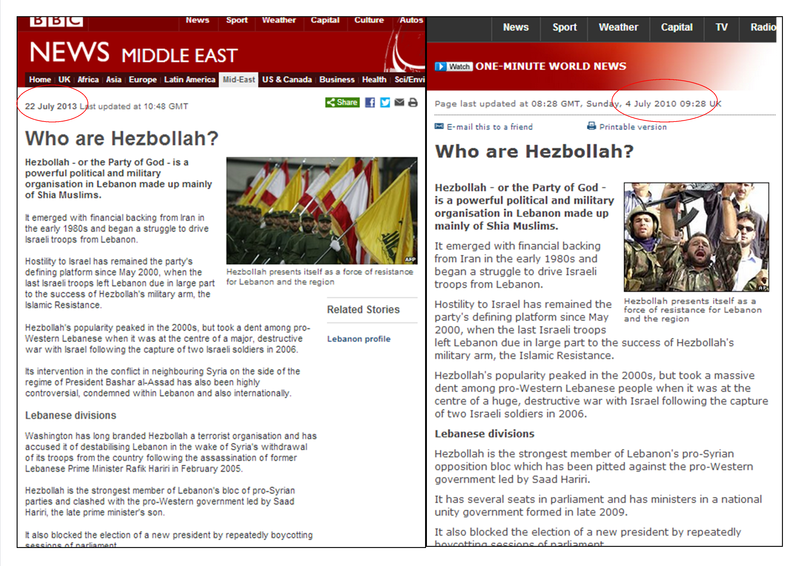 We are very happy to be able to report that the BBC has taken steps to rectify that problem, with a new article of the same title (“Who are Hezbollah?”) having been published on the BBC News website on July 22nd 2013. Although it still describes Hizballah as a “militant group” and perpetuates the false notion of a separate “military wing”, the new profile does go some way towards correcting the important omissions which plagued the old one by, for example, mentioning Hizballah’s involvement in the Syrian civil war. “Since the Syrian conflict began in 2011, Hezbollah has consistently pledged its backing for President Bashar al-Assad and members of its military wing have crossed the border to fight against rebels. It has also provided training and logistical support to Syrian forces. “It has several seats in parliament and had ministers in a national unity government formed in late 2009. However, in January 2011, Hezbollah and its allies brought about that government’s collapse by resigning. And its recent designation by the EU and involvement in terrorism in Europe has been added, although the suggestion that only “Western states” have proscribed Hizballah is inaccurate. “Hezbollah has been blacklisted by the United States, the UK and several other Western states and, in July 2013, the EU also designated the organisation’s military wing as a terrorist organisation. Bulgaria, an EU member state, says there is compelling evidence that Hezbollah was responsible for a bomb attack against Israeli tourists in Bulgaria in 2012 in which six people died. The group denies any involvement. Unfortunately, however, a member of the public carrying out a simple internet search for information about Hizballah appearing on the BBC website will not arrive at this new updated profile because the first result which appears is still the old outdated article from 2010. Logic would suggest that an out of date article which has been replaced by one more suited to the needs of BBC audiences should be removed from the BBC website – especially if, as in this case, they appear under the same title. Surely the BBC’s Search Engine Optimisation team could make sure that the up to date item appears instead of the outdated one. 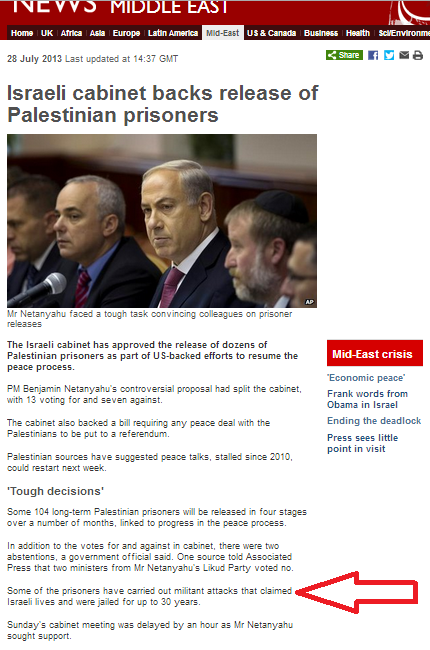 Originally running under the headline “Israeli cabinet backs referendum bill”, an article appearing on the Middle East page of the BBC News website on July 28th 2013 underwent multiple changes to both its body and title as the day went on until its heading read “Israeli cabinet backs release of Palestinian prisoners“. 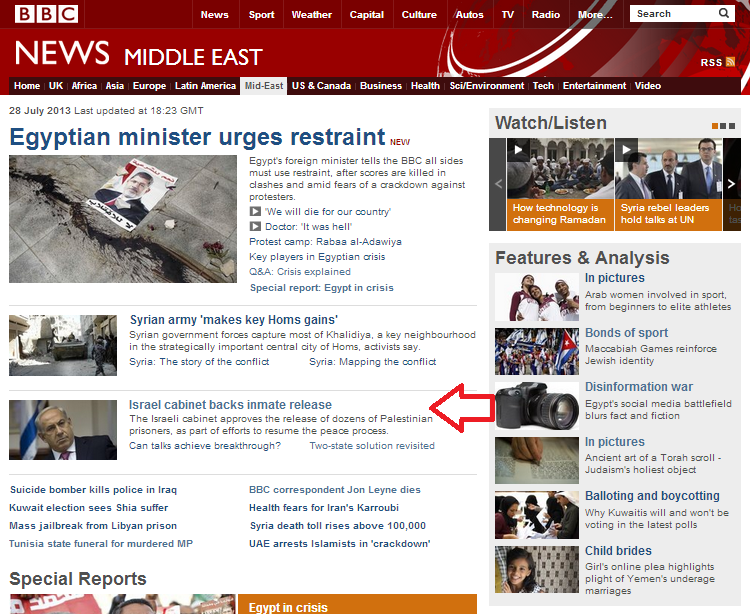 On the Middle East homepage, the same article was displayed under the heading “Israel cabinet backs inmate release”. The article’s penultimate paragraph once again promotes the distorted version of the breakdown of the previous round of talks in 2010 which the BBC has been hawking to its audiences intensively for the past few months. With regard to the issue of over a hundred convicted terrorists (described by the BBC as “dozens”, for some reason) scheduled for early release by Israel as a ‘goodwill gesture’ to prompt Palestinian arrival at the negotiating table, the BBC’s choice of wording to describe the men themselves is predictably euphemistic, ranging from “inmates” to “prisoners”. In fact, as shown in the translated list of those potentially scheduled for release which we published here in June, the vast majority of these prisoners carried out heinous acts of terrorism. The BBC is apparently afraid to tell its audiences the truth about these men. It whitewashes their crimes with euphemisms such as “militant attacks”, never mentioning their victims or details of their crimes and never informing its audiences of the effect that their release will have upon family members of those victims. Clearly, to tell BBC audiences the accurate and impartial truth about these terrorists and the full meaning of their release would undermine the existing narrative on the subject of the Arab-Israeli conflict which the BBC has long gone out of its way to promote. 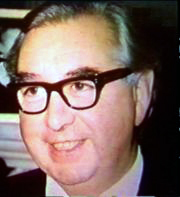 However, in blatant breach of the ‘Public Purposes’ defined in the BBC’s charter, audiences will not be able to comprehend the gravity of the proposed release of over a hundred violent terrorists, and the real meaning of that step within the framework of renewed talks, if they continue to be provided only with censored information. 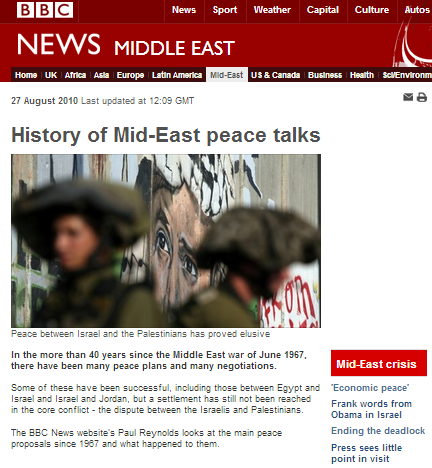 Via the country profile of Israel on the Middle East page of the BBC News website, readers can reach an interestingly illustrated page entitled “History of Mid-East peace talks” compiled by Paul Reynolds in August 2010. The first entry on that page relates to the subject of UN SC resolution 242. “Resolution 242 was passed on 22 November 1967 and embodies the principle that has guided most of the subsequent peace plans – the exchange of land for peace. 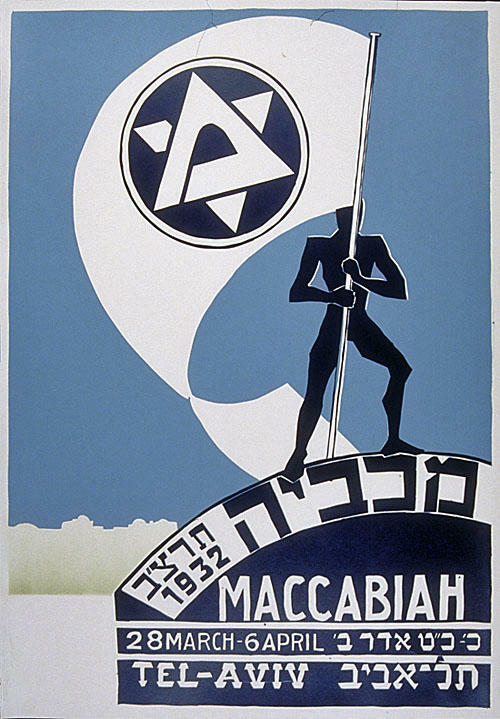 The resolution called for the “withdrawal of Israeli armed forces from territories occupied in the recent conflict”, and “respect for and acknowledgement of the sovereignty, territorial integrity and political independence of every state in the area and their right to live in peace within secure and recognised boundaries free from threats or acts of force”. The resolution is famous for the imprecision, in English, of its central phase concerning an Israeli withdrawal – it says simply “from territories”. The Israelis said this did not necessarily mean all territories, but Arab negotiators argued that it did. The third paragraph of this entry severely misleads BBC audiences. The wording of resolution 242 is not imprecise: it was deliberately phrased in that specific manner by those who drafted it. But by presenting that wording as some sort of typographical oversight, and by concealing the fact that many others besides “the Israelis” have, over the years, clarified that the lack of definite article in the sentence is deliberate, the BBC lays the groundwork for the presentation of attempts to distort the resolution’s intent as though they were of equal validity. “The Six-Day War of June 1967 ended with cease-fire resolutions adopted by the Security Council. 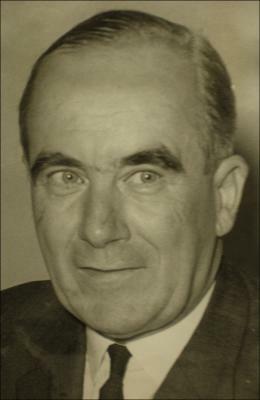 However, neither the Security Council nor the General Assembly, which met in an Emergency Special Session, called upon Israel to withdraw to the armistice lines established in 1949. Most likely, the reason for this was the conviction that a return to those lines would not guarantee peace in the area, as the 1957 precedent had proven. In answer to this request, the Security Council was duly convened and debated the crisis in its meetings of November 9, 13, 15, 16, 20 and 22. So let’s take a look at what some of the people who actually composed the wording of the resolution have had to say about it. “We could have said: well, you go back to the 1967 line. But I know the 1967 line, and it’s a rotten line. You couldn’t have a worse line for a permanent international boundary. It’s where the troops happened to be on a certain night in 1948. It’s got no relation to the needs of the situation. “I have been asked over and over again to clarify, modify or improve the wording, but I do not intend to do that. The phrasing of the Resolution was very carefully worked out, and it was a difficult and complicated exercise to get it accepted by the UN Security Council. There are many other examples which also clarify the fact that the wording of resolution 242 was in fact deliberately very precise and intended. It is therefore unfitting that the BBC should chose to misrepresent it in this disingenuous manner and the fact that it does so clearly contravenes BBC guidelines on accuracy and impartiality as well as deliberately misleading BBC audiences. At around 10 p.m. on Sunday, July 21st a missile fired from the Gaza Strip hit the Eshkol region of southern Israel. On the morning of July 24th, two mortars were fired at the same area, but fell short. These latest incidents bring the total number of missiles targeting Israeli civilians fired from the Gaza Strip since the ceasefire which brought Operation Pillar of Cloud to an end last November to twenty-six (February – 1, March – 2, April – 10, May – 2, June – 5, July – 6). Three additional missiles have been fired at Eilat from the Sinai Peninsula during that time. Of those 26 attacks originating in the Gaza Strip, the BBC has reported on the incidents on February 26th 2013 – the first attack after the ceasefire – and those of April 2nd, and April 30th, to which Israel responded. Of the attacks on Eilat, the BBC only reported the incident of April 17th 2013. In other words, the majority of missile attacks targeting Israeli civilians continue to be ignored by the BBC, as was the case in the months before Operation Pillar of Cloud. It is of course difficult to imagine such patchy BBC reporting were those missiles directed at British citizens. If and when Israel is forced to respond to the renewed attacks, BBC audiences will yet again lack the background information which would enable them to put the news into context. As was also the case last year, Israel’s Civil Coordination Department has relaxed the requirements for permits to enable residents of the Palestinian Authority-controlled areas to enter Israel during the month of Ramadan. On the first Friday of Ramadan, over 90,000 Palestinians entered Israel for prayer services or family visits and by the end of the holiday over a million people are expected to have taken advantage of the opportunity to visit Israel. But if you get your news from the BBC, you would know nothing about this rather special Middle East event at all. 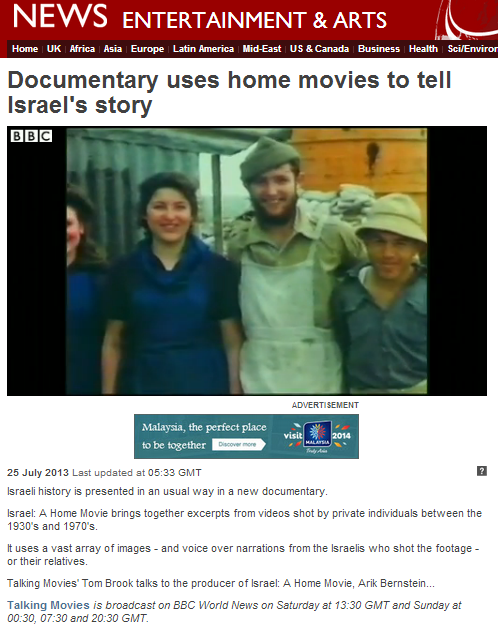 On July 25th a filmed item headlined “Home movies tell Israel’s story” appeared on the BBC News website’s Middle East and Arts & Entertainment pages. The clip is from Tom Brook’s ‘Talking Movies’ film news and review programme which is broadcast on BBC World News. But as other reviews of the film – along with its trailer – indicate, the footage which Brook elected to overlook is no less significant. That particular section of the film can be seen in Hebrew here and footage of the ‘marbarot’ (temporary camps for the new immigrants, including many who had fled Arab lands) in the harsh winter of 1951 can be seen here. It is not unreasonable to assume that images such as those “have rarely been seen” by BBC audiences either – and perhaps even less than they have seen footage of Palestinian refugees. Israelis, it seems, will not be allowed to have their own intimate moments of recollection without the BBC demanding that they be more objective about it than any other nation remembering its history. Some might call that double standards.